We are wanting to configure our Windows client to use only TLS 1.1 and greater. We've learned that we can do this by editing the registry. Now we want to make several HTTPS requests from different applications and check to be sure that they all use TLS 1.1 and above. What we have tried is to run Wireshark with (ip.dst == 137.117.17.70) && ssl and with (ip.src == 137.117.17.70) && ssl as the filter and then run a web request from Internet Explorer. The results show this for the Client Hello. And they show this for the Server Hello. My sense is that that means we have not successfully turned off the legacy protocol, because the Client Hello initially says 1.0. Is that right? Here is a better way of filtering for the Client Hello and Server Hello for a specific IP address. There are two "Version: TLS 1.0 (0x0301)" instances in this picture. The first one is from the header of the record that contains the ServerHello. The second one is from the contents of the ServerHello message itself. The second one is the one you are interested in, because it is the way the server informs the client about the protocol version that will be used for this connection. Have you tried the command? That's an standard output that shows the protocol being used. 0060 - 4c df 5c c9 22 08 b2 94-25 aa 48 07 a2 f6 50 b8   L.\."...%.H...P. 0070 - f7 90 a7 46 25 bf 9e 46-05 62 7e bb 6e 61 8e ef   ...F%..F.b~.na..
0080 - ad 37 c4 e1 17 f4 57 42-c9 d0 e9 85 cb 65 cf b2   .7....WB.....e..
0090 - 4c 2e 98 e0 38 6a da 16-62 de 3e 51 e2 2c de 84   L...8j..b.>Q.,.. Not the answer you're looking for? 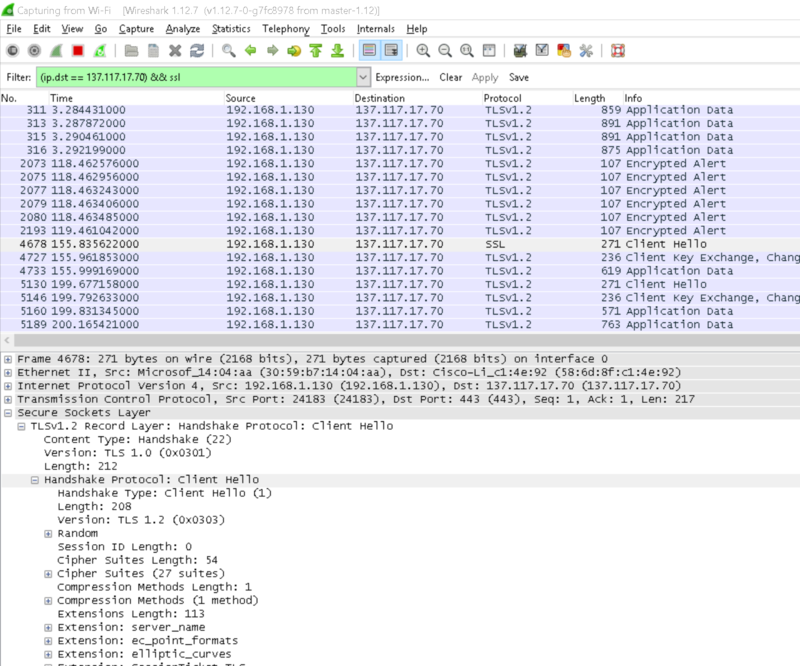 Browse other questions tagged tls windows wireshark or ask your own question.